The Black/Purple has been the single best selling fly for Enrico period! It works well in low light and bright light conditions. The yellow and chartreuse are great producers for us as well! Sold here in the standard size 2/0 with weed guards for fishing around mangroves or brushy/weedy areas. If you don't like the weed guard...easy enough to clip these off. The Peanut Butter Bunker series has been the best seller in the Enrico line for years now. They have caught tarpon everywhere as well as stripers, snook, redfish and sea trout. Just about anything that swims will eat this fly! We use them around Ohio for largemouth and stripers as well! 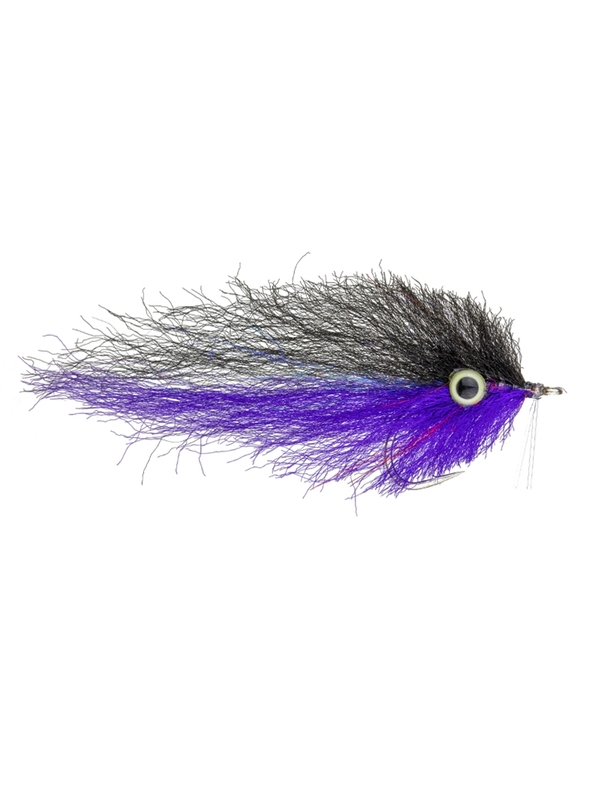 Enrico Puglisi's Peanut Butter fly in size 2/0- Black/Purple is the color here. This fly measures approximately 3 1/2" long.